There are numerous benefits to supplementing your loyalty program with SMS Text Messaging. Many businesses overlook the power that SMS text messaging can bring to their loyalty program, when it comes to engaging and creating loyal customers. Now with 250 character SMS messages for the cost of a single SMS Credit, coupled with over a 95% open rate, text messaging is the single most effective communication channel available to businesses. With instant communication, you can drive customer traffic at desired times and influencing shopping behaviors to your advantage. Typical uses are to operate member-only secret sales, to promote flash sales on slow days or drive extra traffic on holidays, to encourage feedback, collect data or drive customers to desired web pages and advertisements. 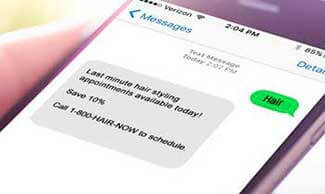 The unique advantage of SMS Text Marketing is it's ability to reach a large number of customers near instantly, delivering your message to the right customers at the right time! Unlike other channels, including email, direct mail and even phone calls to voicemail, text messages passively deliver to your customers' mobile phones, with a subtle vibration, making it easy, effective and economical to communicate your message. We recognize the important of SMS text messaging to your marketing ability, so we strive to deliver rock bottom credit prices for SMS messages. Mobile Alerts (Send out alerts to individual members on demand. For example, "Your car is ready for pickup!". DISCLAIMERS: Available only to subscribers in the United States and Canada. Requires a Loyalty Marketing Subscription. Alternate charges may apply for non-USA/Canada destination inbound and outbound SMS. All unused credits, including pre-paid credits expire upon subscription termination. Credit purchases are non-refundable Prepaid pay-as-you-go plans available at higher rates.